Delicious Expeditions would like to introduce you to the best of Slovenia. Fresh from the garden, and the forest, is the theme of our culinary tour to Slovenia. A tiny country nestled between Italy, Austria, Hungary, and Croatia, Slovenia abounds with medieval villages, storybook castles, cosmopolitan cities and rolling vineyards. Slovenia’s rich culinary history has its roots firmly planted in both Italian and Austrian fare. The cooking portion of our tour will focus on seasonality and sustainability. We'll cook and dine on the freshest ingredients available--from the river, the forest and the nearby farms. Included in the price of our Slovenia cooking vacation are 7 nights accommodations with breakfast (2 nights in Ljubljana & 5 nights at the Novak Lodge), all ground transportation after arriving to the Ljubljana hotel, all group activities, cooking classes and meals, except for dinner on Day 2. 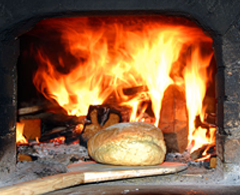 A $1000 deposit is required to secure your place in the Slovenia culinary tour. Since the number of participants is limited and accommodations vary, early registration is advised. After arriving to Ljubljana, settle in at the 4-star Allegro Hotel in Old Town. We'll meet for cocktails and introductions along the river before heading to one of the city’s most popular restaurants for a multi-course Slovenian meal. 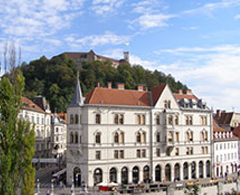 Enjoy the morning on your own, exploring Ljubljana's dazzling hilltop castle and charming riverfront shops and cafés. Afternoon walking tour where we'll lunch along the way, discovering some of the town's best culinary secrets. Free evening. We'll head to the Novak Lodge by way of the picturesque Julian Alps. Our first stop, Skopia Loka, is one of Slovenia’s best preserved medieval towns. After walking the narrow, cobblestone streets, we'll lunch on regional specialties at a centuries-old restaurant as well as visit their historic gingerbread factory. 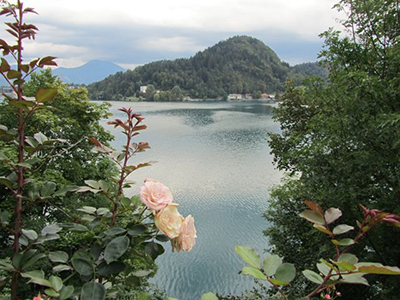 Then on to Lake Bled with its castle and famous pastry shops. 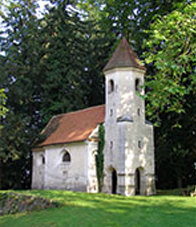 Visit Sticna Abbey, the oldest monastery in the country. Discover its herbal pharmacy and sip tea grown in its garden. Lunch at Otecec castle in their award-winning restaurant. An afternoon cooking class of local specialties will be followed by dinner. Orange wine tasting. We’ll begin our day with a mushroom hunt in the forest. Then gather in the kitchen to make the fruits of our labor into an inviting meal. The afternoon will be full of optional activities: hiking, cooking or visiting the nearby spa town of Dolenjske Toplice. 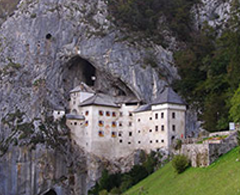 Predjama castle, nestled into a hillside, is our first stop on the way to Slovenia’s most famous wine region--Nova Gorica. We’ll lunch at an acclaimed restaurant before a wine tasting at a local vineyard. Then we'll cross the border into Italy and visit Trieste, perched on the Adriatic. Enjoy the coffeehouses and wander the streets. Forage for wild herbs and nettles along the river. Then incorportate everything into a seasonal lunch. Afternoon schnapps making class, followed by a village LIČKANJE—- the traditional Slovenian corn harvest. Farewell dinner. After a final breakfast together, return to either Ljubljana airport or train station.